You can use this Lorentz Force Calculator to compute the effect of the magnetic field on charged particles. Reading the text, you will learn about the Lorentz force law, th corresponding Lorentz force equation, and about Lorentz force application in the daily life. Lorentz Force comes as a common effect of electric and magnetic field acting on a charged particle. We will focus here only on the magnetic part of the force. For the electric part you can check the Coulomb's law Calculator. The Lorentz Force Law states that a magnetic field exerts a force on a moving charged particle. The value of the force depends on the charge, on the velocity and on the strength of the magnetic field. What is a bit special is that the direction of the force is neither along the path of the particle motion nor along the magnetic field. The direction of the Lorentz force is perpendicular to both the particle direction and to the magnetic field. As an effect, the particle's trajectory bends in the magnetic field. Also, Lorentz force is zero if a particle moves precisely along the lines of magnetic field. How can we write these observations in the mathematical form? That's the Lorentz force equation. F is the resulting force. In our Lorentz force calculator, we set for simplicity the angle α = 90°. If you want to change it, go to the advanced mode. You can see that the force is maximal for that angle, and if we set α = 0°, it is also equal to 0. Lorentz Force finds applications in many areas. In science it is used to accelerate particles in cyclotrons in the quest of finding fundamental laws of particle physics. It is also used in mass spectrometers that allow for identification of atoms and molecules. Practical daily applications include electric motors, loudspeakers and, likely less common among typical households, railguns. 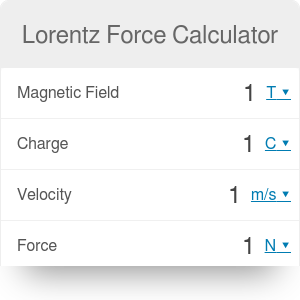 Lorentz Force Calculator can be embedded on your website to enrich the content you wrote and make it easier for your visitors to understand your message.